I found a music school and have signed up for a 10 week class. The First Baptist Church of Ocala has a music department and offers one on one music lessons for several instruments, the teachers are all music majors or graduates from different colleges and universities here in Florida. My first lesson starts March 23 and they use the Essential Elements book. I tried checking out the "DRONES FOR INTONATION PRACTICE" page here and all the bars for playing the sounds are grayed out. I guess I need a plug-in to play them but don't what, would anyone know? I'm using Firefox if that helps. For the drones.. hmm.. doing the same thing on my computer here at work (using Chrome). Not sure what is needed to make them work, it might be that something in the webpage needs edited by the webmaster. I looked at the source and the file is a .mov, which requires a codec to run. It's an Apple format and they don't support windows anymore, but the drones work using Microsoft IE. If Fiddlerman used something more generic it would work regardless of platforms. I redid the drones to suit more systems. This should work for you. Thank you very much Pierre, they work perfectly now in Firefox! Ditto. Very glad to have those. One minor note - they don't repeat automatically anymore. Don't know if that's a technical limitation of the new format or an oversight, so I thought I'd mention it in case it's the latter. Now they do Charles. Thanks for asking. 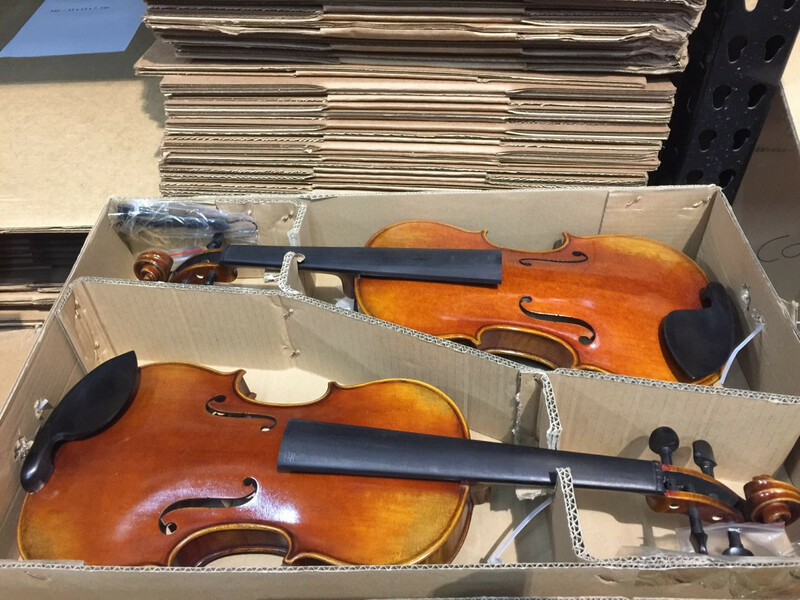 Great news my violin has arrived. Michael sent an email with two violins to choose from. After some discussion on the phone I made my selection, I choose the upper violin. I originally requested a one piece back but none came in this shipment but I'm very happy with the book matched back. Michael liked that one also, and once set-up Pierre (Fiddlerman) will create a video playing Amazing Grace and post it on YouTube. The service that I have received from Michael and Fiddlerman has been beyond compare. They really take the time to answer your questions and the encouragement they give to a newbie like me is invaluable and greatly appreciated. Today I go and meet my teacher and will begin my lessons on the 23rd. Wooo, so excited for you!!! Congrats on your new journey! You will have fun!!! Thank you Mandy and Fran! Mandy - I was doing a search on violin humidifiers and came across a comment you had made that your teacher didn't like the Dampit humidifier and preferred the Oasis OH-6 that you place in your case. Did you get one and do you like it? I'm not sure I really need one here in Florida since it gets so hot and humid all the time. What are your thoughts ? Thanks! For the Dampit the only reason my teacher doesn't like them is it's harder for her to keep track of when she needs to re-wet them, and it makes too much work to make sure you're keeping your violin from drying out too much. But if you don't mind that she said they do their job fine. I did get the Oasis, and I like it, it does its job and is easy to use. I'm not sure that you would really need one being in Florida. In the summer here I don't use it, since we have rather humid summers. I just use it once we have to turn on the furnace. OK! Thank you for your advice Mandy! I'll wait and see once I get my violin. Pierre (Fiddlerman) created a video of my violin on YouTube. 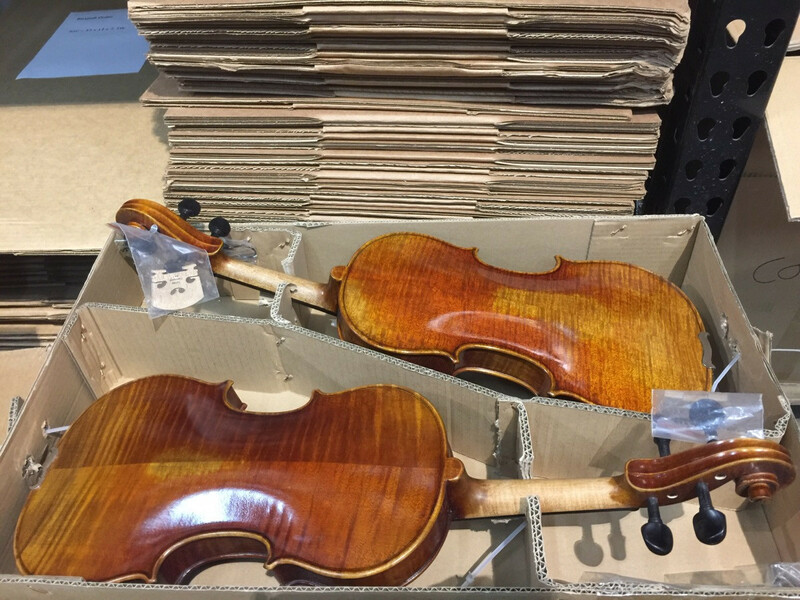 Many thanks to Michael and Pierre for bringing so many folks to love the violin and their unbelievable customer service! Congrats, @Fred - if you're anything like me, or the rest of us, you'll be counting the minutes until it arrives ! LOL! That's so true Billy, thank you! And, of course, once you get to know her, she'll let you know what her name will be.... it will just come to you one day while you are playing.... mine are Violetta, Connie, Luci and Yabé. You'll have to let us know ! @Fred How's the new violin? Fran it is an absolute dream, it is so light it feels as though it is floating in the air. And the sound is incredible, though I can only bow it and play a simple scale on the D string the sound is so pure. I have been practicing with my eyes closed so that I can accurately change which string I'm playing but also to train my ear for the proper tone of each string. I've been using the EE book which my teacher said she uses so that's been a lot of fun, and I am anxiously waiting for my lessons to begin on the 23rd.